Which version of Fotosizer Professional is right for you? What happens when I click one of the "Buy Now" buttons? When you click one of the "Buy Now" buttons above, you will be redirected to a 3rd party payment gateway FastSpring. You can complete your purchase through our page on their site, choosing quantity of licenses and enter your contact and payment details. We do not receive any of your credit card/payment details from FastSpring. How will Fotosizer Professional be delivered? When you have completed your purchase of the Fotosizer Professional edition, you will receive your product license key on the completion page, along with a link to download Fotosizer. You will also receive a confirmation email with the same details and another email receipt of your purchase. What is meant by "lifetime license"? When you buy any of the variations of Fotosizer Professional, you receive a "lifetime license". This means that you will be eligible to receive any updates or future new versions completely free without needing to buy the product again. Will my license still be valid if I upgrade my computer? If you upgrade your computer or buy a new computer, simply uninstall Fotosizer Professional and then let us know so we can reset your license, then you can activate Fotosizer Professional again, or use our License reset service. If I buy a multi-computer license, what does this mean? 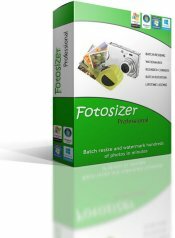 When you buy any of the variations of Fotosizer Professional that allows to be installed on more than 1 computer, you will receive a single product key to activate each computer installation. You will be able to install using the same product key on as many computers as the license allows. Fotosizer Professional is supported on Windows XP/Vista/Windows 7, Windows 8 & 8.1 and Windows 10. There are no Mac, Linux, iOS, Android or Chromebook versions.